Portland—the city where young people go to retire, home of Stumptown Coffee Roasters, and filming location of that one show. We present four modern homes located in one of the friendliest cities around. Ben Watson and his partner, Claudio Tschopp, relocated from Basel, Switzerland, to Portland's Pearl District eleven years ago. Surrounded by forests, their small Northwest and mid-century modern-inspired open-plan home, with an emphasis on natural local materials and natural light, was designed in 1972 by local architect Edgar Waehrer. To brighten the kitchen, which was once the darkest room, Watson and Tschopp decided on a glossy white finish, painted directly on the same rough-cut cedar paneling used throughout the house. Stainless steel appliances and vintage bronze hardware add luster. Jennifer and Mattias Segerholt lived in Los Angeles for five years, before taking the plunge and moving to the City of Roses. 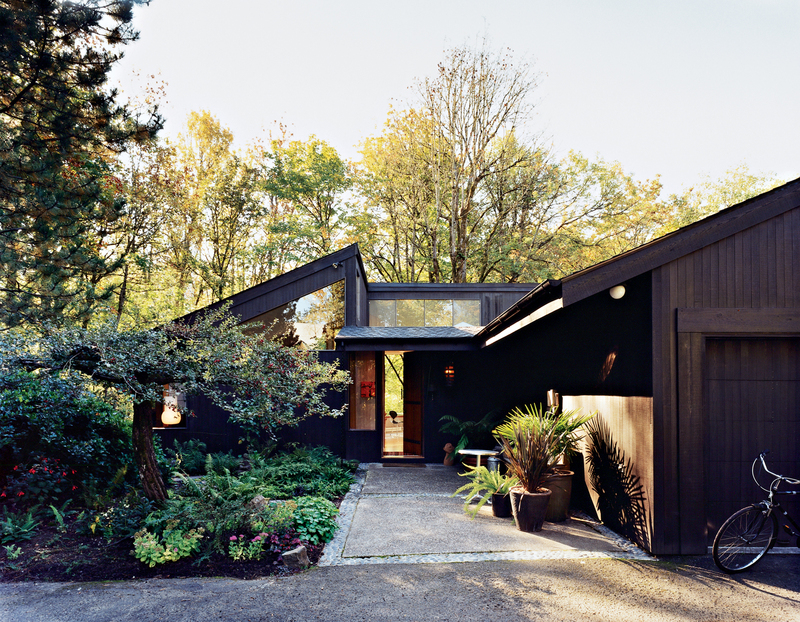 Upon arrival, they found their near-crumbling mid-century home "nowhere near done." Frustrated, the couple took matters into their own hands, such as hiring a specialist to have their poured white concrete floors installed and radiant heating fixed. A Doble dining table by Montis stands in the center of the dining room. Vintage Finnish wallpaper "acquired only after Jennifer wrote to a Finnish design blogger and enlisted her translation skills in the transaction" lines one side of the space. "We didn’t feel like we needed more space; we just wanted it to work better,” says Matt Kirkpatrick of the dark series of closed-off rooms that comprised their former apartment. Along with partner Katherine Bovee, the two moved just blocks away to a similarly sized rental in a subdivided Portland four-square, where they designed and built their own small, smartly designed box home. Katherine lounges in the kitchen, while Matt sits at the table he designed. The cooktop, oven, and dishwasher are by Bosch; Bren Reis of Earthbound industries made the cabinets. The Boglis’ thermal energy-powered home in the Alberta Arts District was dubbed the Stump House by the architect—perhaps as a nod to Portland’s nickname, Stumptown—but it might be more fitting to compare it to a sapling. Before officially moving in, the couple frequently passed by their future home while walking their dog. The builder asked them to come in, threw out an offer, and the rest was history. Architect Brian White says of the living room, “we just blew it wide open,” removing walls to create a bright, continuous space.